This abundantly illustrated volume arises out of the painstaking work of the Georgia Quilt Project, the most authoritative survey of quilts and quiltmakers ever undertaken in the state. ""Georgia Quilts"" showcases the diversity of quilting materials, methods, and patterns used in the state from the nineteenth century to the present and reveals how quilts serve as conduits of history and culture. From plain bed coverings of fabric scraps to exquisitely wrought pieces made for the ""best bed,"" each of the 120 examples featured in the book tells its own story of abundance or want, peace or war, tradition or novelty. Instead of the usual chronological approach taken by many quilt histories, ""Georgia Quilts"" looks at a number of themes through which the common story of the state, its people, and its quilting legacy can be told. Chapters follow various threads of the craft, including Civil War - era quilts, the cotton economy, quilting groups, feed sack quilts, everyday and fine-craft quilts, and special-occasion quilts, including those made as gifts to honor athletes at the 1996 Olympic games. The volume's contributors have a deep knowledge of, and strong personal ties to, quilt history and quiltmaking in Georgia. The Georgia Quilt Project, beginning in 1990, has documented more than 9,000 quilts. Volunteers conducted dozens of Quilt History Days around the state, interviewing quilt owners and examining and photographing their quilts. The 120 quilts included in this book have been chosen from the thousands seen by the Project. Some are notable for their beauty, rarity, or workmanship; others are simple, functional objects that have been cherished for their ties to family history. All have their own stories to tell about family, community, and the desire to leave something tangible behind. Better than fiction and more compelling than any history book, Georgia Quilts is a unique account of this state's rich heritage. Culling through more than 9,000 quilts brought to the Georgia Quilt Project survey, the authors formed a book that is part history and part quilt education. Georgia Quilts is spectacular, with revealing stories and fine research. --Merikay Waldvogel "author of Southern Quilts: Surviving Relics of the Civil War "
Quilts are one of America's favorite, and most vital, grassroots art forms. In the 1990s, The Georgia Quilt Project documented more than 9,000 historic and contemporary quilts residing in Georgia, the majority made in this state. Following a series of excellent exhibits, this long-awaited book provides a summary of the research findings that should prove invaluable in comparing our state's quilting heritage with that of other states already surveyed or awaiting similar projects. 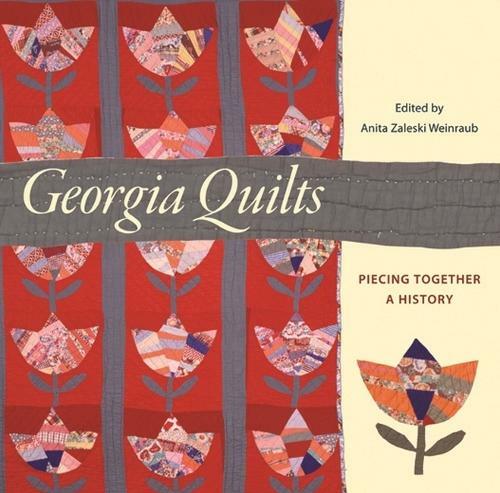 Beyond the data on the quilts themselves, the multifaceted essays offer perspectives that place the quilts within their proper historical, social, and human settings and create, like a pieced quilt itself, as close to a complete picture of Georgia's quilting story as we are likely to see. --John A. Burrison "Regents Professor and Director, Folklore Curriculum, Georgia State University "
Georgia Quilts admirably summarizes almost two-hundred years of creative accomplishment with needle and thread, skill and diligence, and should inspire Georgia quilters for the next two-hundred years. --John Michael Vlach "Professor of American Studies and of Anthropology, George Washington University "
It's nice to see what was once dismissed as 'women's work' finally getting its due. The once-humble quilt, now widely hailed as an art form, takes center stage in Georgia Quilts. With this lush 304-page tome, Georgia becomes the latest U.S. state to proudly claim a scholarly study of its quilts . . . Georgia Quilts offers more than quilts. It gives us the women who made them and 200 years of the Georgia in which they lived. It shows that so-called women's work is as much a part of the fabric of our state's heritage as wars and politics. Amen to that.